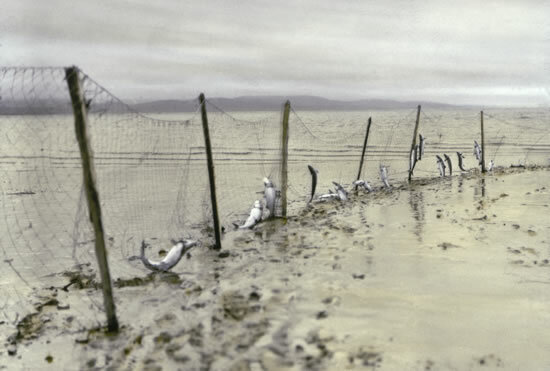 A person could walk out and pick fish from this set net at low tide without using a boat. Aguutekun civvluku kuvya anguarturluteng atercetaqluteng. Ataucicaqliameng-llu-gguq anguarutmek teguluki imkataarluki. Tua-i-llu teguqataarluku neqa cali. 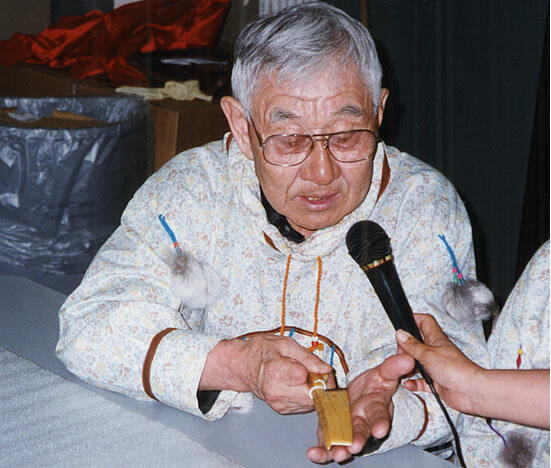 Ayagcetengnaqenritem ugaan tua-i mulngaku'urluku kaugturluku qamiqurrakun nutaan ekluku. Neqaitaqan-gguq, tuaten anguarturluteng neqsulallermeggni. Using a canoe, they'd paddle and set the net and drift downriver. And when a salmon finally got caught, they'd take the end of the net and start pulling it in carefully. And when they got to the fish they'd take it off the net. Trying not to lose it, they'd carefully take it and hit it on the head and pull it into the canoe. They say that was what they did when fish were scarce, when they fished by paddling. Fishing was a laborious task, and so was making the tools to catch them. The amount of sinew or willow bark needed to make even a small net took weeks to prepare. Few owned more than one net, but untied and retied their nets during the season, as different-sized fish became available. King Salmon net made of willow bark. Wassilie Berlin said: "When they made gill nets, they made their depth shallow. Sometimes a fisherman might catch a total of twenty king salmon in a season. People considered him to have caught plenty. Their work was quite incredible." 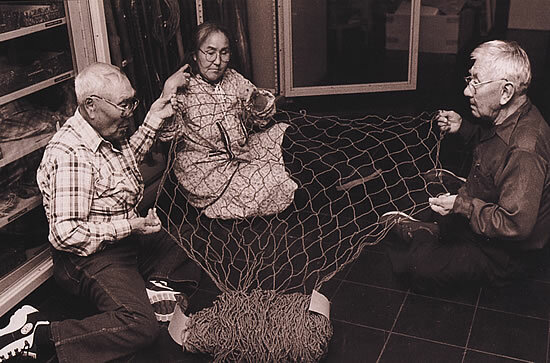 Wassilie Berlin, Marie Meade, and Paul John examine the willow-bark net at the Ethnologisches Museum Berlin. Such nets had to be treated carefully in cold weather or they would freeze and break. 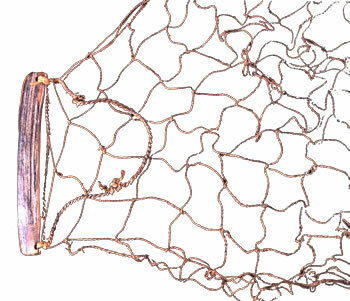 Kuvyaq/Sinew net with sinkers and floats. Phillip Moses said: "After they used sinew nets, they hung them up as soon as they returned to the village. If they aren't hung right away, they rot." 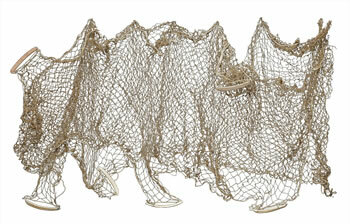 Bird-shaped net floats both to support the net and attract waterfowl. 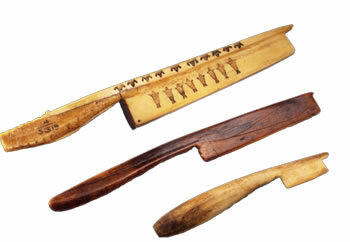 Net shuttles from Andreafski, the large wooden shuttle for making seal and beluga nets, and a bone fishnet shuttle with incised net design. 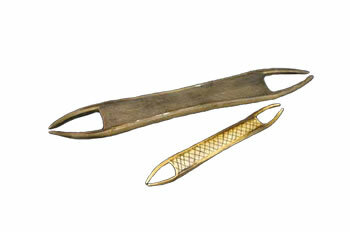 Seal Net Gauge, King Salmon net gauge, and Whitefish net gauge. Phillip Moses said: "Making nets was lots of work. Back then there weren't many nets, even though fish were plentiful."